Our ever-expanding range of video kits is due to our policy of continued product improvement and new product development. 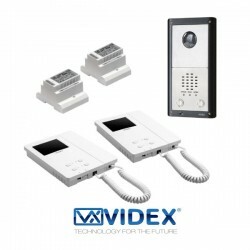 Videx video kits are not only identified by their modern design but most now also incorporate the latest microprocessor technology used in larger systems. The same technology has also been incorporated in the design of the 4000 and 8000 Series range of door panels. 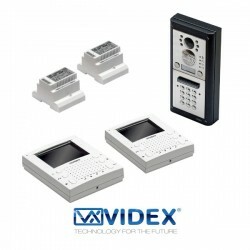 All Videx 4000 and 8000 Series video kits now offer an extended range of functions which include, intercommunication facility (between video intercoms in the same apartment or among those in different apartments), timed privacy with an LED indication, door monitoring, visual and audio indications to confirm system operation, inputs for “push to exit”, options for multiple entrances (up to 4) and the use of a six wire common bus for both 1 and 2 way systems. 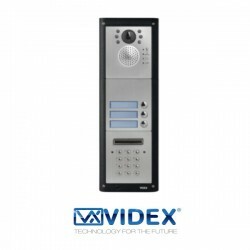 All kits in the 4000 and 8000 range are also available with an integral codelock (allowing users to open the door by entering their access code). A proximity key reader option is also available for the 4000 Series range (where the user can open the door by presenting their proximity fob/card to the reader). All video kits are colour, flush or surface mounted are available in various finishes.